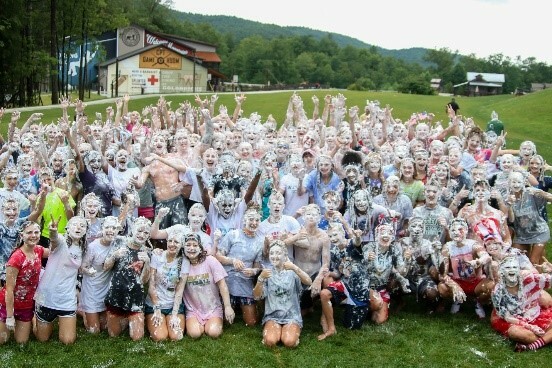 The peer leaders, teachers and freshmen celebrate the shaving cream fight. This is a tradition that many people look forward to for a long time. Meagan Brooker. 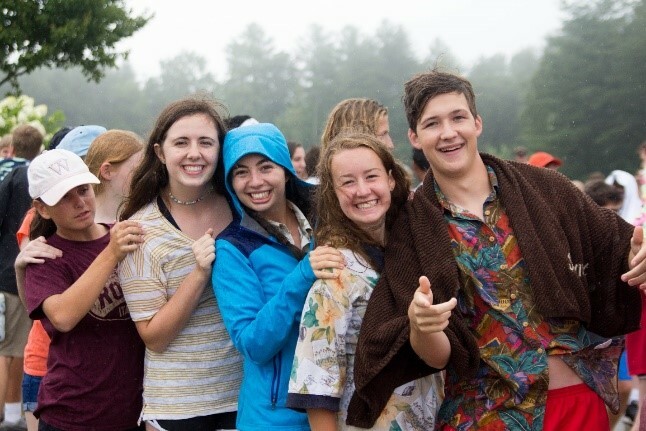 Even though it was rainy, a few of the peer leaders, Megan Gallagher, Kelsey Rappe, Emma Surber and Ellis Schmidt (pictured left to right), still smiled through the games with the freshmen. Meagan Brooker. 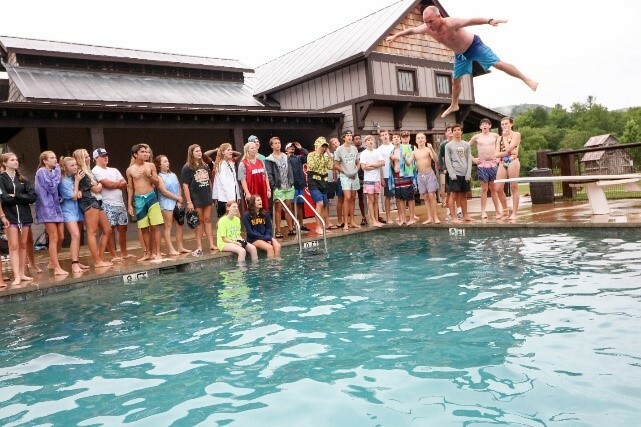 One of the games consisted of a belly flop contest, featuring High School Principle Jeff Plunk. 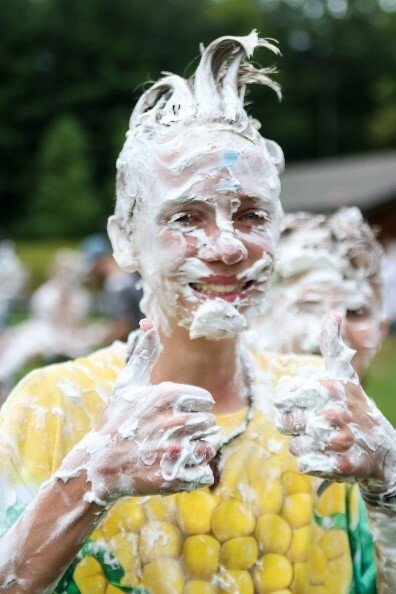 Peer leader Emma Surber said, “It was really funny. 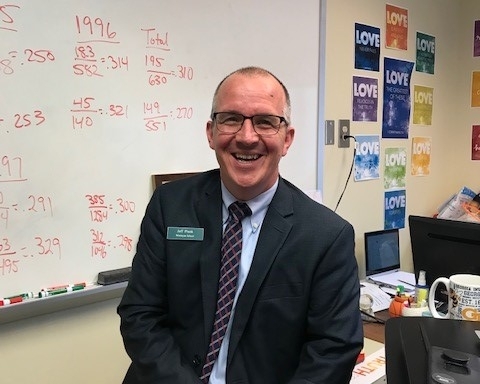 I think it’s so cool that we can say our principal participates in a belly flop contest because at other schools that would probably not be the case.” Meagan Brooker. The annual tradition of a shaving creme fight is one of the major highlights of the retreat. Freshman Fletcher Morris gave two thumbs up as he poses for the camera. Meagan Brooker. 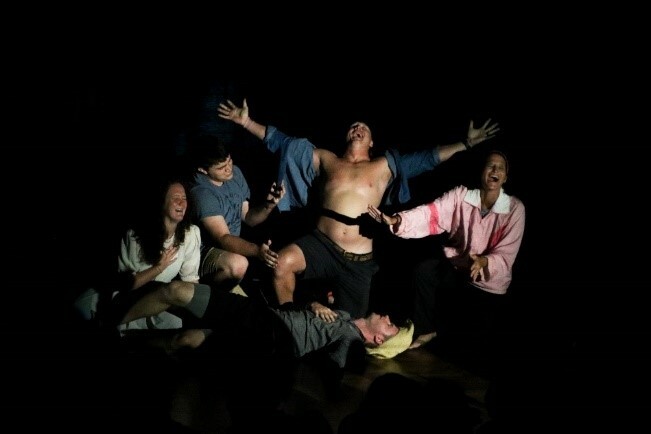 During one of the skits, Coach Dustin Wolf pretended to sing opera while high school English teacher Dawson Zimmerman was mimed chocking; inevitably, Coach Wolf ripped off his shirt. Peer leader Matt Adent said, “I was already thoroughly impressed with Coach Wolf’s acting skills, but when the shirt came off, the game was changed. Hats off to Coach Wolf.” Meagan Brooker. 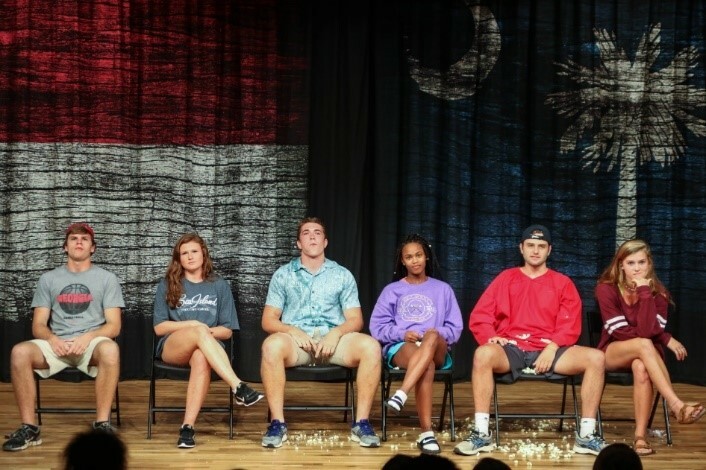 Peer leaders Daniel Salyers, Laurel Lee Chatham, Daniel O’Sullivan, Amaya Register, Brooks Lalley and Maddie Lloyd (pictured left to right) act out the skit “Pass it Down,” concluding with Lalley and Lloyd kissing and surprising many of the people in the audience. Meagan Brooker. The senior work crew poses for a picture before the freshmen enter the dining hall. 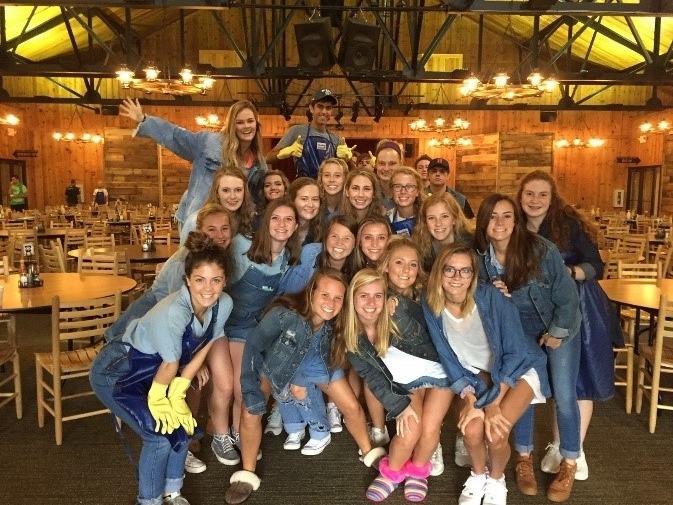 Every day the work crew thought of themes, like all denim, to dress up as to create excitement and fun during the meals. 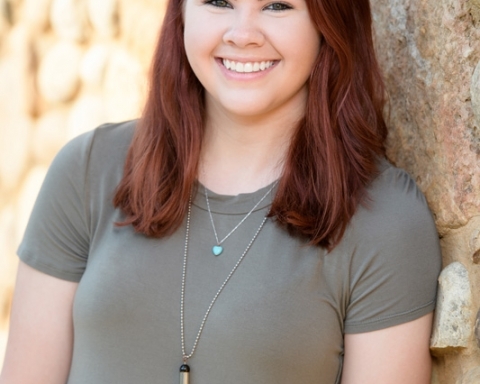 Kendra Morris. Peer group eight, led by Amaya Register and Brooks Lalley, poses for a picture. Reese Alexcih. 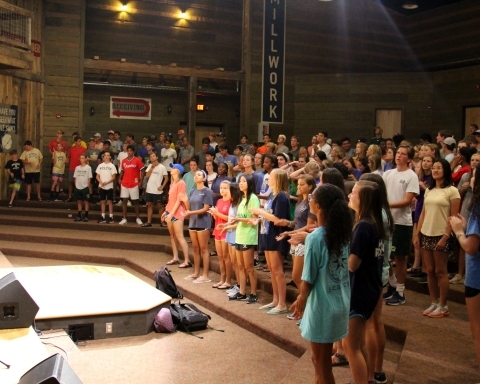 As the summer comes to an end and school begins, the Freshman Retreat is an annual tradition that brings all the rising freshmen together to celebrate the beginning of their high school career. 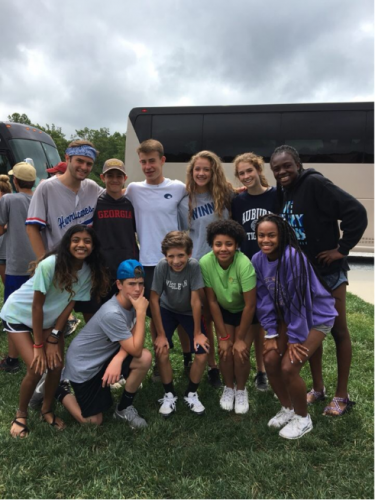 This year, the Freshman Retreat was held at Carolina Point Young Life Camp where the students went to church sessions, played fun games and swam. Peer leaders bonded with their freshmen groups and grew closer as a peer “family.” This year, there are 26 peer leaders, making 13 couples, which are comprised of all seniors. 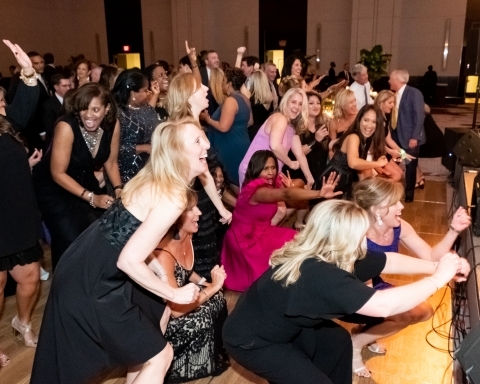 Each couple mentors and spends time with a group of nine to ten freshmen throughout the year. The peer leaders had opportunities to be with their groups through games, group devotion time and meals throughout the retreat. 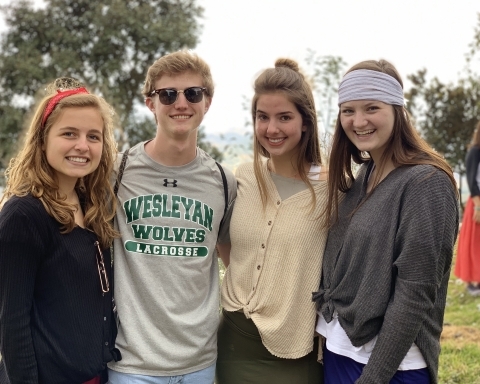 Every day, there were church sessions led by the Wesleyan High School Worship Team and Pastor Glenn Campbell of God First City Church in Johannesburg, South Africa. After each session, Young Life Area Directors Alan Dixon and Hayden Copeland act out skits that made all the freshmen laugh. 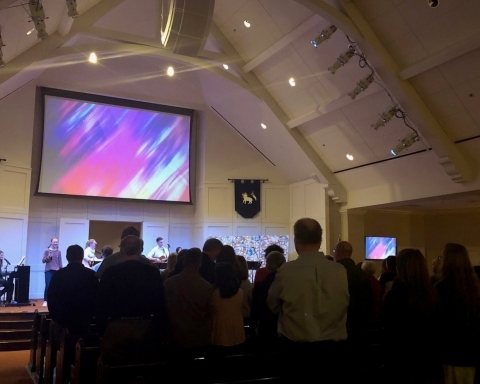 Campbell introduced the Gospel in a genuine and relatable way during the sessions, talking about listening to what God has to say. As the Freshmen Retreat concluded, it was the perfect way to kick off the 2017-18 school year. This retreat encouraged many freshmen to meet new people, step out of their comfort zone and grow closer to God.